Many folks have fond memories of riding a carousel at the fair as kids. The Kindle Fire HD Carousel may not bring the same thrill, but it does have its charms as you swipe through it to see a revolving display of recently used books, audiobooks, music, videos, websites, docs, and apps. If you’ve used an Android device, such as a smartphone, you’ve probably encountered the Carousel concept. On Kindle Fire HD, items you’ve used recently are displayed here chronologically, with the most recent item you used on top. You can swipe your finger to the right or left to flick through the Carousel contents. When you find an item you want to view or play, tap to open it. Whatever you tap opens in the associated player or reader. 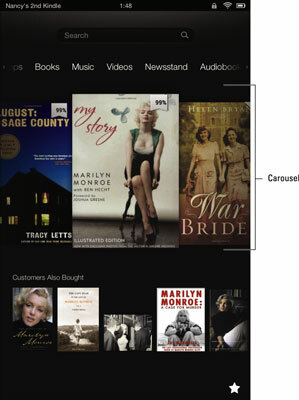 Music will open in the Amazon MP3 music player; video in the Amazon Video player; and docs, books, and magazines in the Kindle e-reader. When you first begin using Kindle Fire HD, before you’ve accessed any content, by default the Carousel contains the Amazon Kindle User Guide and the absolutely free New Oxford American Dictionary. It may also contain recently used content from your Amazon Cloud library.